Following a few months of development and countless hours of bug squashing, we are pleased to introduce Edit Flow v0.6. 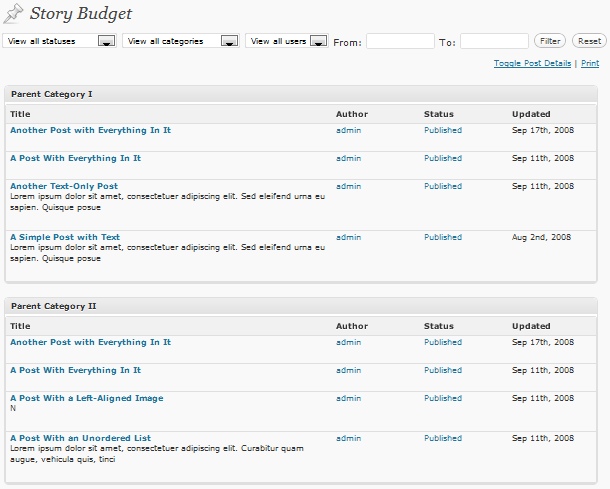 This release includes two brand new workflow features which continue to adapt WordPress for the publishing environment: editorial metadata and the story budget. In addition, our calendar has been rewritten from the ground up, and many bugs have been fixed. We have a special treat for you with this release: a screencast video walking you through all the new stuff we’re so excited about. Take a look! Our goal for editorial metadata is to make it easy to keep track of important information associated with every post, within every post. Contact information for the story’s sources? Saved in the sidebar. Required story length? Saved in the sidebar. 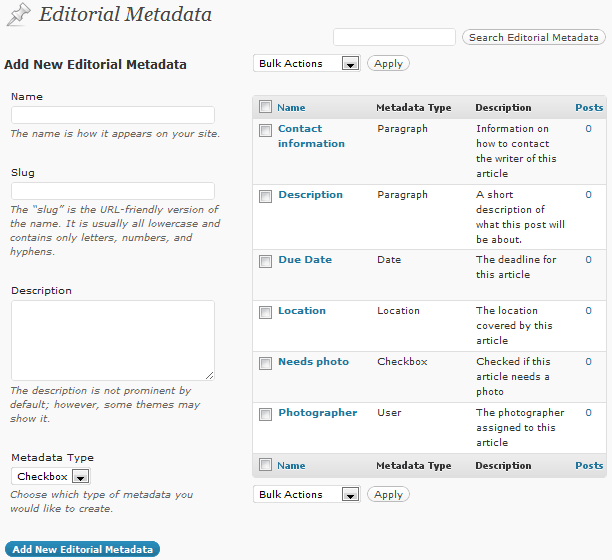 Editorial metadata comes with a bunch of built-in terms, but these can be changed to your heart's content. Our goal with the story budget view is to make it simple to visualize all of your upcoming content in a presentation familiar to more traditional news organizations. This release also fixes many bugs around custom statuses, user groups, and notifications! A full list of changes can be found on the version changelog. If you haven’t upgraded yet, download it from the Plugin Directory or directly from within WordPress. Please use the WordPress.org forums for support, bugs, and ideas. Track our progress and get involved with development on GitHub! I’m just a simple blogger and blogmaster for now. 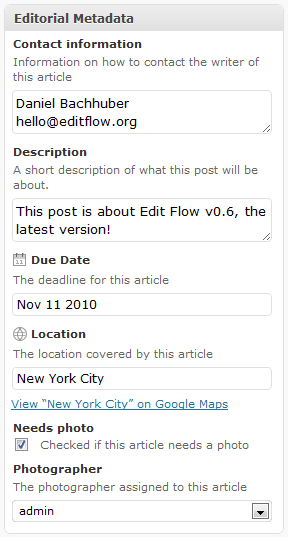 The email notification feature in Editflow plug-in: Does it generate an email alert to assigned recipients, every time a change to a post is made, no matter how tiny the editorial change maybe? The plugin will only send email alerts to specified recipients when the post status is changed or an editorial comment is left. It doesn’t check to see whether the content of the page has changed at all. 1. I’m getting almost all e-mails twice. (Double) This might be related to the admin being the author – but a simple if statement would resolve that. 3. Ideally I would like to disable the option to choose which recipients are assigned altogether on an individual basis. I just want to set some general rules. Essentially I always want the author + the editors user group set as recipients and never anyone else so the options/settings in the author panel are not needed. In fact I prefer for them not to be there. 4. On a similar note, I didn’t find an option to disable the author meta fields altogether from the post edit screen – so I was forced to use this functionality even though we don’t need it. Love the Editorial Metadata concept! Can it be applied in pages too? Yep! Check out the “Other Notes” section in the plugin docs. Love the editorial metadata concept as well. However, I’m curious if there is a way to fill out the sheet and then have an email automatically sent to the assigned writer? What is it that you’d expect/hope for in such an e-mail? Would you want an e-mail sent out anytime the metadata is updated? Should it only be sent to the current author or anyone subscribed to the post? I’m hoping that when I fill out the editorial metadata and then it would alert the current author I assigned that the post has been created for them. So are you talking specifically about editorial metadata of the “User” type which allows you to select an author of the blog from the drop-down? Or the author of the post? What would such an e-mail contain? The email would contact the author to let them know the post has been built and notify/confirm their assignment. And I’m speaking about the “User” selection from the drop down. Ok. We’ve added this feature request to our backlog. Sorry Scott. I have another question. Is there a setting for notification subscriptions that needs to be set? Half of my freelancers get the email updates and half of them don’t. I’m not sure what makes some different from others. Are you still having issues with sporadic notifications with the latest version of Edit Flow (0.6.5)? If so, please let us know in the WordPress.org forums: http://wordpress.org/tags/edit-flow?forum_id=10#postform.